Brigitte Lin (Lam Ching Ha) and Chin Han's film RED DUST (GWUN GWUN HUNG CHUN) from around 30 years ago after digital restoration would be released in Taiwan tomorrow. Winning the Golden Horse Best Actress award with the film, Lam Ching Wan appeared in Taiwan again 5 years later with the RED DUST restored version's Taiwan release. Lam Ching Ha recalled at her rehearsal with Cheung Man Yuk, Cheung Man Yuk w was able to shed tears as large as pearls. She could not admire her more. Two days ago Ching Han did not accept any media interview and avoided the subject of divorce. 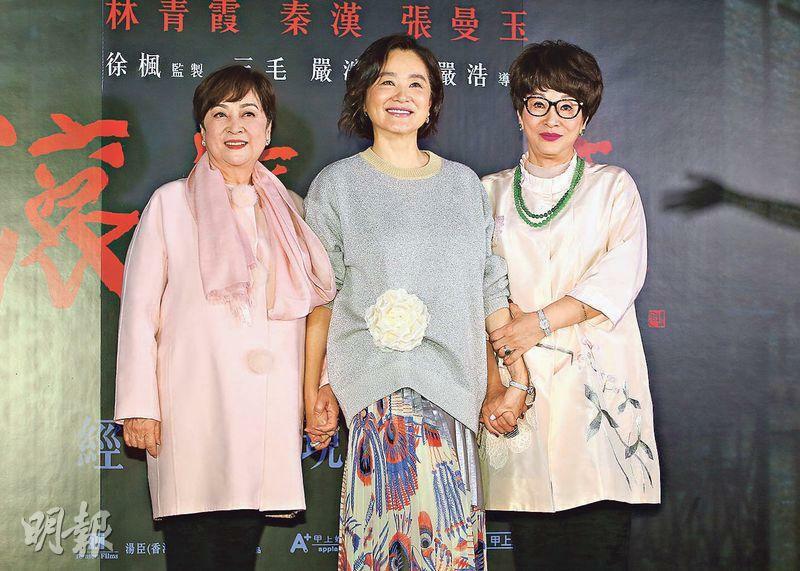 Lam Ching Han two nights ago with RED DUST theme song creator Lo Ta-yu, Best Actresses Chen Chen, Hsu Feng, famous presenter Fang Fangfang attended the event. Lam Ching Ha after marriage eased out of the film industry, the last time she appeared in public in Taiwan was in November 2014. Thus her attendance of the RED DUST premiere in Taipei became a focus. Away from the public spotlight for a long time, Lam Ching Ha did not change appearance wise. Two nights ago she was in great spirit. She even mischievously pointed at the media for photos and happily said that she was very happy to see everyone in Taiwan again with the RED DUST restored version. "I haven't been here in a very long time. I really missed Taiwan's cuisine, family, friends and life in Taiwan. I am very happy." RED DUST was famous writer Sanmao written and Yim Ho directed. The film was a love story in the 40s between the Lam Ching Ha played writer and the Chin Han played official. The film received 8 awards including Best Feature and Best Actress at the 27th Golden Horse Awards and 8 Hong Kong Film Award nominations. It was considered a Chinese film industry romance classic. RED DUST was a milestone in Lam Ching Ha's film career. She mentioned that after making 100 films she won her only Golden Horse Best Actress with this film; before 1990 most of her films were romance. After the 80s she mostly made Hong Kong action films. She said, "RED DUST was a watershed moment, a very important movie in my life." Speaking of her role, Lam Ching Ha said that in her 100 films that was the only writer she played. She was also very honored to be able to play the role because after that she really liked to read and write. She met many outstanding writer friends and so far she has always published 2 books. She joked, "So I didn't let this role go to waste." Speaking of Maggie Cheung Man Yuk's acting display in RED DUST, Lam Ching Ha had nothing but admiration. She recalled in one scene she and Cheung Yuk Man shared a sad embrace. The director at the time asked Cheung Man Yuk to shed a tear on cue. "She truly at that moment shed tears as big as pearls. I truly couldn't have admired her more, to be able to so precisely make tears roll down." Inviting writer Sanmao to write the RED DUST screenplay, Lam Ching Ha revealed that Sanmao wanted to play her close friend. At the time she was very into the character. Sanmao even said to the Lam Ching Ha, she wanted to stand behind the camer and watch her act in every shot. "Very certainly she was the soul of RED DUST. Without Sanmao there would be no RED DUST." Speaking of her interaction with Sanmao, Lam Ching Ha felt that she was able to interpret her role outstandingly because at first Sanmao invited her to read the screenplay in her office. "She didn't just read every word and every line to me, she even acted it out for me. So I had a very thorough understanding of this character." Thus she was able to be the character as soon as she was in front of the camera. Last year divorce rumors surfaced and Lam Ching Ha was rumored to have wed Chin Han. At the time Chin Han's manager denied the rumor. Lam Ching Ha two days ago did not speak to the media and avoided the sensitive topic. As for Chin Han's absence from the RED DUST premiere, the organizers said that at first they did not make any special invitation. Thus in the end they were not able to share the stage. After completing the restoration of FAREWELL MY CONCUBINE (BA WONG BIT GEI), Hsu Feng this time brought back RED DUST to the silver screen; speaking of the opportunity to produce the film, Hsu Feng said that one day Lam Ching Ha called her from Hong Kong. She said that she had a script that she wanted her to look over, because the average film company boss did not want to invest in it. She asked her if she would be willing to make film. Hsu Feng after reading the script was deeply affected, and immediately said to Lam Ching Ha that she wanted to make the movie. "I particularly like to make subjects that others haven't made." RED DUST brought together the classic silver screen couple of "One Chin One Lam". Hsu Feng felt that they were her only choices for these characters. "The script was written for them, they were the most suitable to play them." After watching the rough cut of the film, Hsu Feng even predicted that Lam Ching Han would win the Golden Horse Best Actress. In Hsu Feng's eyes, RED DUST collected Lam Ching Ha, Chun Han and Cheung Man Yuk's most beautiful era. Their acting was just as impressive. As for whether she would plan to make any new films in the future, Hsu Feng joked not to give her too much pressure and stressed that film was what she loved the most. "I will give it my all without any regret." Hsu Feng and Lam Ching Ha were both Best Actresses and would encourage the younger generation of actors. Lam Ching Han mentioned that she was less than 100 pounds back then. "How was I able to withstand the storms when I was so thin. I thought, I must truly love acting". She also stressed that if she ran into a good movie she would not be afraid of any hardship, because when you have a passion for acting she would give it your all. She believed that the audience would be able to see that. RED DUST's theme song was Lo Ta-yu written. He said that the song was nominated for the Best Film Song Golden Horse Award. So far many younger generation singers still sang it. As for his creative process then, Lo Ta-yu said that the lyrics consisted of "triple meter". It symbolized the ever changing, rolling romance under the great era in a beautiful and touching way.